The LostCousins newsletter is published twice a month on average, and all LostCousins members are notified by email when a new edition is available (unless they opt out). To access the previous newsletter (dated 3 July 2011) please click here. Each newsletter links to the one before, and you can go back to February 2009 when the newsletter first went online; there will shortly be an online index to articles thanks to the sterling efforts of members Elizabeth and, especially, Gill. Whenever possible links are included to the websites or articles mentioned in the newsletter (they are highlighted in blue or purple and underlined, so you can't miss them). Note: when you click on a link a new browser window or tab will open so that you don’t lose your place in the newsletter - if you are still using Internet Explorer you may need to enable pop-ups (if a link seems not to work, look for a warning message at the top of your browser window). I've just acquired a new bookcase (well, not new exactly - I was there when my parents ordered it at the Ideal Home Exhibition in 1958). It's just as well that I now have space for more books, because the National Archives have launched their Summer Sale, which invariably includes a few volumes that I just can't resist (not surprising when you consider that there's up to 80% off, and UK delivery is free when you spend £15 or more). There are currently 87 titles available - though past experience suggests that the list will quickly shorten - and it's a wide-ranging selection, including several that would make good Christmas presents, and not just for fellow family historians. But you do need to step warily: the blurb seems to date back to the launch of the book, which in the case of Chris Pomery's Family History in the Genes was nearly 4 years ago - so to describe it as "the very latest advice on a fast-moving subject" could be just a little misleading. What I usually do before placing an order is look the books up at Amazon, partly to see the reviews, and partly to make sure that I'm really getting the bargain I think I am. From 0.01am (London Time) on Saturday 16th July until 11.59pm on Sunday 31st July you can save 15% on any new findmypast subscription when you click here and enter the code LOSTCOUSINS07 on the findmypast Subscribe page (you'll need to Log-in or Register at their site before the box appears). As a BONUS I'll give you a free LostCousins subscription that runs alongside your findmypast subscription. To qualify for the bonus you must click the link above immediately before subscribing to findmypast (otherwise we won't receive the commission that pays for your LostCousins subscription), and also forward to me a copy of the email receipt you receive from them so that I can verify your entitlement. Your free LostCousins subscription will run for the same period as your findmypast subscription unless you are already a LostCousins subscriber, in which case your bonus will commence when your existing subscription expires (ie the expiry date will be extended by 6 or 12 months, as appropriate). Note: existing findmypast subscribers qualify for a 20% loyalty discount when they renew, therefore the 15% discount and bonus offer do not apply to renewals. You'll find full details of the findmypast Loyalty Scheme here - make sure you qualify! When you can't find the person or family you're seeking when you search by name, a very useful option is the ability to search by address. I believe that findmypast is the only site to offer address searches for every census - but even they don't have a perfect solution, because in 1841 and 1871 the house numbers haven't been transcribed. However, please bear in mind that if it was a very long street it might have fallen into more than one enumeration district. Another approach is to search by name for a family who, in the preceding or following census, were neighbours of your relatives - since there's a chance that they were also neighbours in the year in question. You'll recall from my last newsletter that when you search the 1911 Census at FamilySearch you can see the place of birth, something that isn't shown in the free searches at either findmypast or the 1911Census site. Michael wrote in with another great tip - if you enter a surname, but no forename, the search results will be listed with members of the same household shown consecutively. OK, there won't be a gap between households, but you can probably figure out for yourself that John aged 3 is the youngest in one household, and George aged 45 is the head of another. Of course, using this technique you won't be able to spot people in the same household who have a different surname - something that's actually quite common. Oh well, you may have to buy that findmypast subscription after all! Rosie wrote in with a tip for findmypast subscribers who are having trouble finding a family because the surname has been badly mistranscribed. At 1911census.co.uk you can search using a different range of criteria that wouldn't be allowed at findmypast - for example, Rosie suggests omitting the surname altogether and including other snippets of information, such as the number of years that a woman has been married. Both sites use the same transcription, so once you've identified the record at the 1911 site you'll be able to find it at findmypast. Tip: if you're planning to add relatives from the 1911 Census to your My Ancestors page, check out my article 'Mastering the 1911 Census of England & Wales', which you'll find on the Help & Advice page. The National Archives are holding a one-day conference at Kew on 1st October which looks at all aspects of the census. At just £30 (or £25 if you book before the end of July) it's quite a bargain, especially since the price includes tea, coffee, and a buffet lunch! You'll find all the details, including the conference programme and speakers, here on the TNA website, By the way, it's worth noting that it's not totally focused on the England & Wales census, and there will be optional sessions on the Scotland, Ireland and other censuses from around the globe. It's not unusual to find relatives living next door or in the same street, and when this happens you might find that two or more households are listed as one on your My Ancestors page. Why does this happen? Because the concept of a household, while very important to us now, didn't exist when LostCousins first began 7 years ago - and so when you choose to sort the entries by Household (which to my mind is the best way to list them), they are actually sorted according to the census references. Most of the time this produces exactly the same results - but if there are two households with the same census references they'll appear as one. The first thing I should say is that no matter how they appear on your screen, it won't affect your chances of finding 'lost cousins', because I match your relatives individually, not by household or family unit. However, I know that over the years quite a few members have found it disquieting that two households could appear as one, so I've now come up with a solution that will - in almost every case - solve the problem of presentation. I have to thank Chris, one of our most loyal members, for his prompting because it was just moments after I'd told him that - given my very limited programming skills - I couldn't possibly fix the problem (which I'd been puzzling over for years), that I had a moment of inspiration! (1) Click on the name of one of the individuals; you'll notice that towards the bottom of the Edit Ancestor screen there's now a new field called 'Household'. (2) Normally it will be set to 0, but if you change it to any other number - I've chosen 5 in this case as my relative was in the 5th household on the page - this person will appear separately from the others on the same page. (3) Repeat for other members of the same household, so that you now have two households where previously there was only one. (4) If there were not just two, but three or more households that were merged together repeat the process for another household, using a different number, and continue until all the households are shown separately. Note: there is one limitation - you currently can't edit the Household number for a relative who has already been matched with another member. Over the years there have been many parish registers whose contents have been transcribed and printed in books. Most of this happened in the 19th or early 20th century, which means that the books are now out of copyright, and can often be found online through sites like Google Books and Archive.org - where you'll also find many street directories and trade directories from the Victorian era. Note: last month Google and the British Library announced plans to digitise 250,000 books from 1700 t0 1870 from the BL's collection. Click here to see the press release. However, as I know from experience, finding out what's available and accessing the information isn't easy, and it can be very time-consuming and frustrating - so much so, that I've often wished that I could pay a small sum to have someone do it for me. Unlike most of my wishes, this one came true! LostCousins member John wrote to tell me about a site called Flatcapsandbonnets.com where you can buy DVDs with compilations of dozens, or even hundreds of books. Better still, the books have all been made searchable, something you won't necessarily find when you download an online book. I was so impressed that I arranged a discount offer for LostCousins members (even though the disks are very cheap, it's always nice to save a bit extra). If you place an order between now and 14th August you'll get a 15% discount when you quote the code FABLC. Postage is free within the UK, and for overseas buyers it's just £2 no matter how many disks you buy - which sounds like a bargain to me. Tip: make sure that you look at the list of what's on each disk before you order - don't blame me if the parish you're interested isn't one of those that the Victorians transcribed! Prior to 1813 it was common for baptisms and burials to be recorded in the same register, and before 1753 you'd have found marriages there too. You're unlikely to find it much of a problem because it's obvious which are which - but if you're relying on someone else's transcription, be prepared for some surprises. For example, Jill wrote to tell me that because baptisms, banns, and burials for Swainsthorpe (in Norfolk) were recorded in a single register between 1800 and 1812, both the Norfolk Records Office and FamilySearch (two organisations who should have known better!) have put all the entries under baptisms. I've heard of similar problems with some of the registers that Ancestry have transcribed recently. So if you can't find the baptism you're seeking, maybe you should look for a burial! This amazing project utilises a dedicated band of volunteers to photograph war graves, working in conjunction with the Commonwealth War Graves Commission. So far over 1.6 million named graves and memorials have been photographed, and the aim is to photograph them all - click here to search the records so far. Copies of the photographs are available at a very reasonable cost, and if you're interested in volunteering your services you'll find details here. If you have ancestors who attended the Royal Military college, Sandhurst or the Royal Military Academy, Woolwich you'll be interested to know that many of the records are now online. The Woolwich Cadet Registers cover the years 1790 to 1793, 1799 to 1805 and 1820 to 1939. Those for the Sandhurst cover 1800 to 1946. Both sets record the name, age, date of entry, commissioning date and corps or regiment joined. Occasionally they can give examination results, information about the father, or in the case of RMA Woolwich, sometimes the school - but the subsequent career of the cadet is usually not covered. 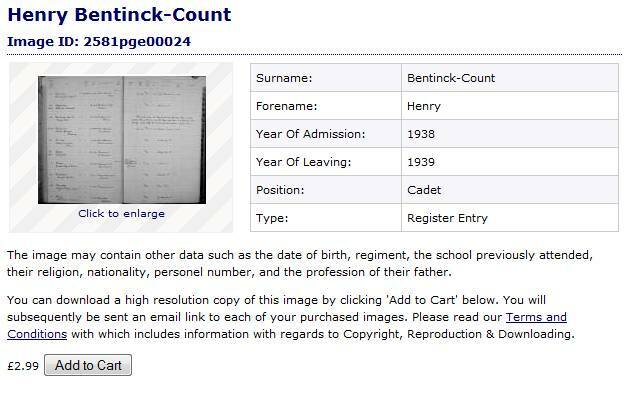 As far as I know I don't have any relatives who went to either establishment, so I checked out the free search facility by looking for Henry Bentinck, the father of Tim (who I wrote about at length in my last newsletter, and is one of the most illustrious members of LostCousins). Although the image can be enlarged, I found that it was still unreadable - but the cost of obtaining a high-resolution copy isn't unreasonable, and the quality is very good although the images are watermarked to guard against illicit copying. Note: an original script of the very first episode of 'The Archers' sold yesterday at Sothebys for £6875, double the pre-sale estimate (for the same price you could have bought two letters signed by King Charles 1, plus one signed by King Charles II). The script was sold by Charles Collingwood, who plays smarmy Brian Aldridge in the serial - which has been broadcast regularly since 1951! Just as I was finalising this newsletter I noticed that several new sets of military records had been added to the findmypast site, the most intriguing of which is their 1861 Worldwide Army Index. If, like me, you've had trouble finding male ancestors in the 1861 Census, and have suspected that they were serving with the British Army, this new index could well provide the answer! Whereas the Army Lists you'll find at some websites only record commissioned officers, this index is based on paylists held by the National Archives, and covers approximately 98% of the 'other ranks' who were serving in 1861 - about 245,000 men in all, or around 2% of the male population. The other military datasets added yesterday are all from the London area, and include records of the Paddington Rifles and Royal Fusiliers, and the Surrey Recruitment Registers. Click on any of the links in this article to see the information page for the records concerned. Over the past two weeks I have been upgrading the My Summary so that when you log-in a LostCousins you now see more relevant information than ever before. For the first time you can see precisely how many entries you've made from each census - which I know from the feedback I've had is really important to members. "Fantastic. The new format is so much easier to see 'at a glance' I never realised that the 1911 census could be put on the site so I will now pursue this option as soon as I can." "Opening on the statistics page is a good idea - I found it very helpful as I had been away from the site for a while. Likewise the entries by census - makes me want to improve those which are lacking. I can't think of anything which could improve it further at the moment. It is a very user friendly site and your News Letters are second to none - I don't know how you find so many interesting things to talk about!!" "Your new changes work well for me, as I was unaware that LostCousins accepted entries from the Scottish 1881 census." "I like the new approach, it works as an instant reminder for so many things. I like the way you have broken down the entries by the different censuses." "I love the statistics page." Why not log-in to your LostCousins account now, and see why the improvements have been so popular? Tip: if you go to your My Details page and select 'Yes' alongside 'Auto log-in on each visit' (in the Privacy Settings section) you'll be logged-in automatically whenever you visit the LostCousins site - just so long as you didn't click 'Log-out' at the end of your previous visit. It's a great timesaver! When I was corresponding with Lawrence earlier this week he mentioned how my tip in the June newsletter (about free online access to the National Probate Calendar between 30th June and 8th July) had enabled him to make lots of new discoveries. In particular he found that whilst his great-great grandfather - a shipwright - died in a lunatic asylum following an epileptic fit, leaving his widow eking out her existence as a laundress for over three decades, his elder brother - also a shipwright - took a job in the Royal Naval Dockyard at Portsmouth and had three sons who were successful naval engineers, one of whom reached the rank of Rear Admiral and was appointed a Companion of the Order of the Bath by King George V in the Coronation Honours List of 1911. What a contrast between the two families! Many of us have similar patterns in our own trees. For example, my grandfather Frederick Wells worked as a boilermaker for the same company from 1900 until he retired in 1947 - on a pension of just £1 a week (which even then was a pretty miserly sum). On the other hand, his 1st cousin - also Frederick Wells - became Lord Mayor of London in 1947, which meant that he was in office when London last hosted the Olympics - there's a picture here of him at the opening ceremony, sitting between Princess Margaret and the Shah of Iran, and just a few places away from King George VI. In Through the Looking-Glass and What Alice Found There the White Queen famously stated "The rule is, jam tomorrow and jam yesterday - but never jam today." Anyway, the reason I'm talking about jam is because when I wrote about my Tomato Jam recipe last year, I was flooded with emails from other jam-making members - so I thought it would be rather fun to have a jam-making competition this year. To enter the competition send me a jar of your best 2011 vintage jam - you'll find the address on the Contact Us page of the website - and at Christmas I shall announce the winners of the Grand Prizes. There will be two classes, one for Tomato Jam (either using my recipe or one of your own), and Open for all other varieties; the closing date will be 31st October, but I would appreciate it if you could send in your entry earlier if at all possible. Please remember to include your name and email address. Remembering what the Dodo said in Alice in Wonderland ("Everyone has won, and all must have prizes"), everybody who enters will get a free LostCousins subscription of between 3 and 12 months duration. Entries will be judged on taste and texture, but marks will be deducted if your jam is in any way reminiscent of Hartley's! If you are short-listed for one of the Grand Prizes you will be asked to provide the recipe for your jam so that I can share it with members through this newsletter. Note: I didn't realise until I looked up the Wikipedia entry for the 'jam' quote that it is a mnemonic for remembering the distinction between the Latin words 'iam' and 'nunc'. Very clever! I mentioned in my last newsletter that many readers with Orange, Wanadoo, or Freeserve addresses had not been receiving my emails of late, and I've subsequently discovered that this is because they have been earmarked as spam. I believe that if you log-in to your Orange broadband account you an alter how they deal with emails that they consider (rightly or wrongly) to be unsolicited junk mail - but it's not something I've been able to check out personally because I'm not an Orange broadband user. Long before spam emails we had junk mail and unwanted telephone calls. Here in Britain you can register with the Mailing Preference Service and the Telephone Preference Service, but unfortunately there are some firms that don't check the registers before contacting you. One such is Tucan Claims, a firm that has called me several times recently - even though I have been registered with the TPS (and MPS) for many years. If you do a Google search you'll find that a number of people have described Tucan Claims in less than flattering terms. If it isn't illegal to call people at random even though they've asked not to receive unsolicited sales calls, then it ought to be - so I find it somewhat depressing that they are 'regulated' by the Ministry of Justice, which gives them an aura of respectability (even though the MoJ say on their website, "authorisation does not mean that a business [is] recommended or endorsed by the Ministry of Justice"). How do I decide what to buy? I like to read what people who've already bought the product in question think about it - and I've found that 9 times out of 10 the best place to find those reviews is Amazon. A lot of people think they only sell books, but in fact they sell just about everything, from cookware to camcorders, computers to keep-fit equipment. You don't have to buy from them - although the prices are usually very competitive you'll sometimes find a better deal elsewhere - but it would be foolish to ignore what previous purchasers have said. I usually start with the bad reviews (if there are any) and only then look at the good reviews - that way I get to see both sides of the picture. Over the past year my purchases have included a stainless steel cafetiere, which I take with me on holiday (why pay £2 or more for a decent cup of coffee? ), and an A3 multifunction printer which allows me to scan and print copies of heirlooms that are too big for A4 (there's an awful lot of them, including those irreplaceable original BMD certificates). One of the best things about the printer is that I can get ink cartridges for little more than £1 each - indeed, I never buy a printer unless I know that I'll be able to get cheap compatible cartridges. At this time of the year I like to spend time outside (in between writing newsletters and replying to emails), so I was pleased to find out that until 18th July Wickes are offering £15 off when I spend £100 on a wide range of garden items. Click here and enter the voucher code WKSPVCGDN at the online checkout to secure your discount. Have you noticed that Family History Monthly has come down in price to just £2.99? This makes it the cheapest genealogy magazine in the UK (apart from this newsletter, of course). It's a good opportunity to buy a trial copy of the magazine! How easy it is to read this newsletter? The answer is, as easy as you want it to be. If the lines are too long or too short for your taste simply change the width of the browser window; if the text is too small (or too large) press Ctrl+ (or Ctrl-). You probably knew all this, but you'd be surprised how many people write to ask me to change the type size or the line length. Finally, here's a way you can exploit my generosity and good nature (I don't mind, honestly). When you take advantage of the exclusive findmypast offer announced above (remember to click on the link in the article first), take 30 seconds to link your own account to that of your spouse or partner before you claim your free LostCousins subscription - because that way you'll qualify for a joint subscription that covers BOTH accounts! To link the accounts simply enter your spouse's personal code (shown on their My Summary page) in the appropriate box on your My Details page (or your personal code on their My Details page - either will work). You might think that this is a stupid question, but have you ever tried searching for 'lost cousins'? Surprisingly, half the readers of this newsletter haven't entered any relatives on their My Ancestors page, or have only entered a token handful. In the time it has taken you to read down this far you could have entered half a dozen households from the 1881 Census, and you could well have found a 'lost cousin', a living relative who is researching the same ancestors as you (the odds are about 1 in 4). Just imagine if every time you received one of my newsletters you devoted 15 minutes to entering relatives on your My Ancestors page - pretty soon you'd be in touch with relatives from numerous branches of your tree that you didn't know existed! It takes me almost 2 weeks to collect the information for this newsletter, turn it into articles that people would want to read, send out 57,000 emails, and deal with hundreds of responses - and by the time I've finished it's nearly time to start on the next one. And yet I still find the time each week to add a few relatives to my own My Ancestors page, because I know from experience that those few minutes have the potential to save me hours, if not weeks of hard slog - as whenever I find a new cousin they invariably have lots of information that it would be very time-consuming (and expensive) for me to collect. It works for me, and it can work for you too - try it! This where any last minute amendments that I make will be recorded or highlighted. I hope you've found my newsletter interesting, and perhaps just a little thought-provoking. Many of the articles are inspired by you, the members, so do please keep writing in with your thoughts, comments, and suggestions.